This is one of the most important things I have ever read on the internet about people. Read it. Always be wary that you do not live in a bubble, because if you do and the bubble pops, you’re going to have one very, very rude awakening. Update: He’s posted a followup, which is just as interesting. Full disclosure: the following post below was originally posted as a multi-part comment on Bob’s blog post linked to above. I waited for my comments to pass moderation status and appear publicly. As of this posting (Hong Kong evening time, 22/10/2014) these comments have not yet appeared on the post in question; I feel that it’s important that my response is read by anyone who cares to. Please try to think of this response as being in no way connected to the ongoing GamerGate controversy; I am not going to go back on my words and spew about the GamerGate movement any more on this blog out of a belief that there’s far too much said already and I stand by that. What I wrote below should apply universally regardless of affiliation or beliefs, and I hope years from now there are people who will read this and think very carefully how they view the world. I believe it’s extremely important to not just me but people as a species, and the Universal Theory of Pocky – one of the core tenets of this blog. Addendum: the link here is also required reading although it is tonally inflammatory. Proceed with caution. Man of Steel is a decent film. Some might even say great, if you measured greatness by the sheer amount of things that get punched to pieces. Sometimes I do, because I’m easy to please. However, it does not exactly have a great Superman in it. People much smarter than I, fans of the character across different generations and well-versed in all forms of Superman media as well as the many different versions of Superman, have written at length on the subject. I’m actually here to talk tokusatsu and the Amazing Spider-man 2 (or Amazing Spider-Man: Rise of Electro for those of you who live in Britbongland, areas that were previously Britbongland colonies or have trouble keeping track of numbers, reboots or number of villains in each movie). Let me preface this by saying this is going to be long and probably a bit personal, and by no means do I consider myself an expert in the fields of spidermanology, tokusatsuism and superman…ism. Living in Hong Kong, I get exposed to a melting pot of culture. Many of them have their own noodles. There are many things about a bowl of noodles I find philosophical. Each culture’s bowl is representative of their cultural identity. Screw ambassadors for culture like pandas or white dolphins. The way to the heart is through the stomach, and to the best of my knowledge, we don’t eat pandas. So I figure I’d start talking about noodles. Fear not, this is my life blog – not a food blog, but food is such an essential part of life in Hong Kong that I can’t really avoid talking about it. So where to start? Locally. 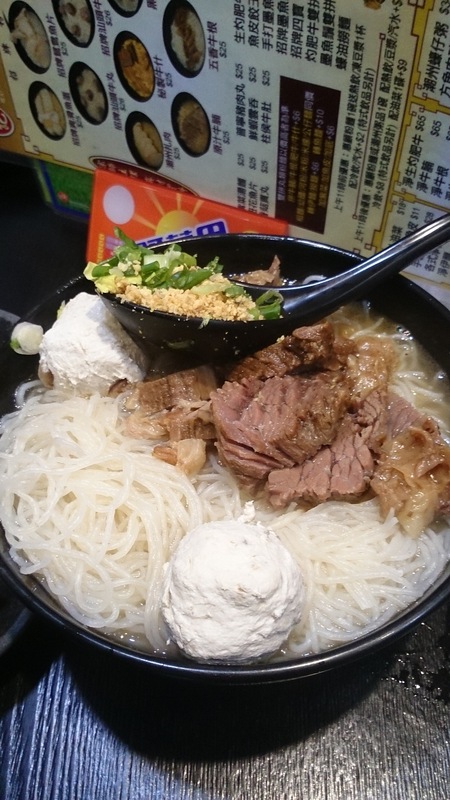 Beef brisket and squid ball on rice vermicelli, with aromatics. Hell yes. So last Thursday we go to KFC for lunch. I have a very strange relationship with fast food. I crave the stuff from time to time and its easy accessibility means that more often than not it’s within reach. It’s easy to sell and market, and it’s the low-hanging fruit of consumerism. People will always need food, and people go fast. Fast food is the obvious step in filling a market need. At the same time, the marketing strategies and products used by the mega-conglomerates that own big pieces of the fast food businesses are often so misguided so as to seem completely repulsive. A few of my friends have heard me bring up the term “KFC regret” in casual conversation. What is KFC regret? It encapsulates the entire KFC experience. It’s the narrative KFC (and parent Yum! Brands) spends billions of dollars trying to sweep under the rug. I don’t know why they bother – regret is retroactive. It only happens after the fact, when you’ve already spent money on KFC products.